The Assembly Knight of the Year for 2017 is SK Joseph Kristofl. Joseph is the Assembly Flag Program Chairman. 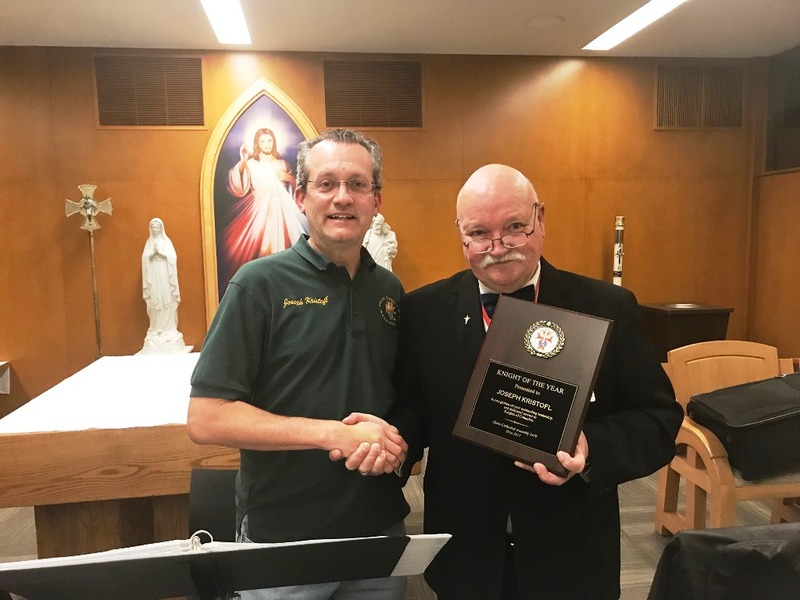 Faithful Navigator Hans Anter presented Joseph with his award at the February meeting. Christ Cathedral Assembly 3479 gave out almost 350 small United States flags to second grade students in Catholic schools in the Diocese of Orange County, CA. A short Power Point presentation was given with slides of the 13 star flag, the flag description, flag retirement procedure, the flag colors and the Pledge of Allegiance. The students and knights recite the Pledge of Allegiance. The Knights explain how they were instrumental in having the words “under God” included in the pledge. Two Knights display a 3’ x 5’ United States Flag and demonstrate the correct way to fold the flag. The teachers and students have enthusiastically embraced this program and invited us back for next year. Some of the students said they were going to ask their fathers to join the Knights.